In android 4.3 you have a facility to create Multi Users environment on your tablet. That means Multiple people can set up their own accounts on the same device and log into their own profiles. Every user of that tablet can have their own home screen, backgrounds and even individual game data like high score and levels. But this feature is only available on the tablets. In this new Android 4.3 you can control the other profiles if you are an admin on that system. You can make sure that which apps your child can have access on this system. Restricted profiles are ideal for friends and family, guest users, kiosks, point-of-sale devices, and more. Bluetooth Smart Ready technology is a low power technology which used in fitness sensors, heart rate or glucose monitors, pedometers, thermometers, and much more. 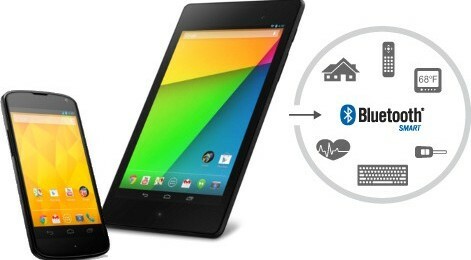 Now many Android devices like New Nexus 7 and Nexus 4 now support low-energy Bluetooth Smart accessories which are based on Bluetooth Smart Ready. In Android 4.3 Google introduces OpenGL ES 3.0 which produces the high quality texture in games through both framework and native APIs. OpenGL ES 3.0 also adds to the graphics of an smartphone or tablet by extensive set of required, explicitly sized texture and render-buffer formats, reducing implementation variability and making it much easier to write portable applications. At last after reviewing all the features of the Android 4.3 we say it is great to have a tablet running Android 4.3 because its most important feature of Multiple user is available for tablets only. In Play there also improvement in the apps for the tablet. But still for Smartphone Android 4.3 is not bad it is Good one to have. Moreover these features may come to smartphones in future.